Poor Mojo's Classic Rant: Brian_Sack "You Are Bidding On A Mistake"
You are bidding on a mistake. We all make mistakes. We date the wrong people for too long. We chew gum with our mouths open. We say inappropriate things in front of the wrong people. And we buy leather pants. I can explain these pants and why they are in my possession. I bought them many, many years ago under the spell of a woman whom I believed to have taste. She suggested I try them on. I did. She said they looked good. I wanted to have a relationship of sorts with her. I'm stupid and prone to impulsive decisions. I bought the pants. The relationship, probably for better, never materialized. The girl, whose name I can't even recall, is a distant memory. I think she was short. Ultimately the pants were placed in the closet where they have remained, unworn, for nearly a decade. I would like to emphasize that: Aside from trying these pants on, they have never, ever been worn. In public or private. I am not a member of Queen. I do not like motorcycles. I am not Rod Stewart. I do not cruise for transvestites in an expensive sports car. These were not cheap leather pants. 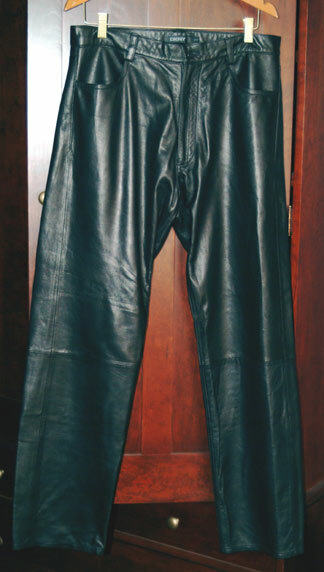 They are Donna Karan leather pants. They're for men. Brave men, I would think. Perhaps tattooed, pierced men. In fact, I'll go so far as to say you either have to be very tough, very gay, or very famous to wear these pants and get away with it. Again, they're men's pants, but they'd probably look great on the right lady. Ladies can get away with leather pants much more often than men can. It's a sad fact that men who own leather pants will have to come to terms with. They are size 34x34. I am no longer size 34x34, so even were I to suddenly decide I was a famous gay biker I would not be able to wear these pants. These pants are destined for someone else. For reasons unknown - perhaps to keep my options open, in case I wanted to become a pirate - I shuffled these unworn pants from house to house, closet to closet. Alas, it is now time to part ways so that I may use the extra room for any rhinestone-studded jeans I may purchase in the future. These pants are in excellent condition. They were never taken on pirate expeditions. They weren't worn onstage. They didn't straddle a Harley, or a guy named Harley. They just hung there, sad and ignored, for a few presidencies. Someone, somewhere, will look great in these pants. I'm hoping that someone is you, or that you can be suckered into buying them by a girl you're trying to bed. Is The Right All That's Left?